During the Greco-Roman period, painted masks like the one pictured here were placed on the deceased to help their souls achieve immortality. 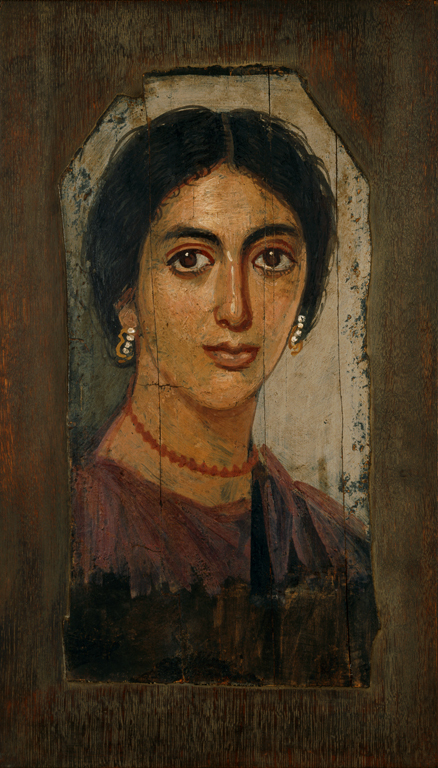 These paintings are sometimes called Fayum portraits, referring to the region in northwestern Egypt where the masks were found in tombs of the elite governing class. Milwaukee Journal Sentinel, April 7, 2002, p. 1E and 12 E, color illus. p. 1E. Parlasca, Klaus. Ritratti di mummie. Vol. 2. Palermo: Banco di Sicilia, Fondazione Mormino, 1969, p. 48, no. 323, illus. pl. 77, 2. Collections de feu m. Jean P. Lambros, d'Athènes et de m. Giovanni Dattari du Caire. Antiquités égyptiennes, grecques et romaines, June 17–19, 1912 [auction catalogue]. Paris, 1912, lot 613, b/w pl. LXI.